School was largely uneventful the next day – although some of the other students wanted to know how he’d pulled that stunt off. It had really been cool! He just informed them that he had a way to store a few spells, and that he’d had an offensive one stored just in case. Hopefully he wouldn’t need anything like that again before he cold get another one stored! At work he once again lingered late (and watched for spies; there was a little more of that – but nothing too extensive. They just seemed to be observing right now) – and finished up the Verdigris Staves. Then it was off to meet Gri Fel and Terapishim with their teapots, cookers, and a Verdigris Staff for Terapishim – at yet another restaurant with fair privacy. They were glad to meet him. They’d been trying to iron out their old disagreements – which had turned out to be surprisingly easy when the places they were concentrated on hadn’t existed for many millennia. He presented Terapishim with his Verdigris Staff. His eyes lit up at that. Hm. Where would it be good to look? The bureaus of Humanity and Nature were the obvious place to start of course. He’d have to see what he could find. He didn’t have any real connections there though. Gri Fel and Terapishim would appreciate any aid, since it was no fun being an unemployed deity – it was just that he didn’t really have any bureaucratic influence. Maybe, someone in the bureau in the right chain of command needed something? 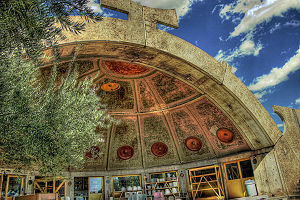 It took some effort – some divining, a few questions, and (mostly) just asking at the bureaus, before he learned that Scales-Of-Gold, one of the gods on the committee involving new cities, was getting tired of the gridlock on Arcosanti. Apparently having to do the meeting minutes every day was cutting into his crocodile activities time. Anybody who could help him with that, or help him cut through the arguments, would get his support in the decision process. There wasn’t much more that Scales-Of-Gold seemed to want or need otherwise… Well, if he could get in to see him, maybe he could help! He did have some minor presents he could give. Fortunately, since Charles had already attracted the Bureau of Nature’s attention, it didn’t take too many presents to get past the minor obstacles – and Scales-Of-Gold made some time for him. Well, they had seemed pretty sane to him. Oh boy was it late! He REALLY had to get some sleep! Scales-Of-Gold did have to wonder… Was the child trying to just… fix things because it was nice? He wasn’t up to anything major, but to get even this far, he’d have to have some fairly unusual resources, as well as rather more ideals than anyone normally managed to hang onto in Yu-Shan. A few others already had that idea. Eventually, of course, Charles would attract serious notice. There were people keeping an eye on him now of course – but at the moment that was mostly because he was a child who’d been placed in an important position, and so presumably had powerful patrons who wanted to remain anonymous. By divine standards he was producing fairly minor artifacts and supporting relatively minor causes. Still, there might be some useful leverage there, even if it was unlikely to be anything too large on the scale of Yu-Shan. Once truly serious investigations began, the Siderals might take notice – and realize that he kept somehow disappearing outside of fate. The next morning the Inukami let him sleep in a bit again – and packed him off to school still yawning. First period was free, and thus went to working on his research paper. He had such a lot to do the rest of the day! He rapidly piled up the books and notes, using his new inkstone to take notes faster. It was very handy for that! He was a bit sorry he hadn’t kept the bigger hearthstone, but the mercenaries had needed it. Still, he’d sent contact information, so he might hear from whoever was behind it! Several of the instructors were actually wondering why he hadn’t been transferred to magical evaluation – or even to magical combat – classes yet, but they could understand it if his parent wanted him to be able to handle physical violence. Still, it would really be nice to know who was backing the boy! He seemed to be able to handle it, but entrusting that kind of magical resources to a child was… perhaps imprudent. Staff sparring proceeded as usual. They hadn’t yet gotten to the “go ahead and let the advanced students beat on him” mode yet, even if they were now sure that he could take it; he was making reasonably satisfactory progress without going that far as yet. Charles was, as usual, very careful not to hurt anyone – although that was less trouble with a staff than with a sword. That was appreciated by the other students – although there was a bit of injury-treatment anyway, when one of the clumsier students accidentally hit himself with his own training sword. Fortunately, it was just a mild concussion and bruising. Charles made a personal note to get some boosting amulets made for everyone! Then it was off to show off his botanical collections in Herbalism. Sadly, the herbalism teacher was currently meeting with functionaries of the Bureaus of Nature and the Sub-convention on Demons (a subdivision of the Convention on Essence Wielders). Aw! He’d brought all the plants he found too! And they were substituting cooking! Well… he could get quite absurd there, but he stuck more-or-less closely with actual cookery (Ok, with maybe a BIT of alchemy on the fudge. It always crystallized on him if he didn’t). Still, a lot of cooks in Yu Shan doubled as alchemists, so a little was fine. His fudge was competent, if uninspired. He knew all the ingredients, but he’d never done much cookery. Siranaya, however, was making a salad – and was struggling not to make it poisonous. Did she need a ward against poisonous plants over the salad mixing bowl? Ah, it looked like her touch also tended to turn things poisonous. Evidently, poison was a part of her nature. She’d managed to make it nonfatal, if a bit on the bitter side – but then poisons tended to lean that way. The instructors judged Charles’s fudge as reasonably competent – if a bit heavy on the nuts. They also advised him against eating quite so much candy and sweets. The endless sugar rush was not healthy for a youngster! They both passed, although it was clear that some of the other students had odd heritages. Fortunately, the instructor was a semi-draconic entity, and could eat anything – including the lava souffle. Charles only sampled carefully. Most of the stuff that was actually digestible was quite good, and some was delicious – although how he was supposed to eat gems was beyond him. He wound up passing on all the mineral-based stuff. The make-up class for today was music again. Still on vocal music; Sanxian was next week. Well, he wasn’t improving that fast, but at least he had the basic idea. That was perfectly normal for a slightly-better-than-mortal student. For today, school being done was something of a relief! Off to work! Which, by now, was completely routine, at least for the artificing part. Most of the time went into planning more artificing and testing whether or not his proposed ingredients would work. Work at the factory-cathedral proceeded as usual for the first couple of hours. The machinery was churning right along, the purification systems were humming in vaguely musical fashion, and Charles’ planning went along with few hitches. Even the spies seemed a little less obvious today. Then he spotted a flash of black light over by Essence Purifier Eight. Charles zipped over to check! The workers in the area were in a bit of a state. A few were moving away as quickly (and as safely) as possible. Most were transfixed on the pitch-black dome next to the purifier. It had a slight indigo cast to it. Was it not working properly? He could shut it down and let the place run on the other eleven… Black was weird though. Usually there was a more… active energy-display – and the input-output readings all seemed to be completely normal. His own divinations said that the reactor was actually working just fine too. The aura though… That actually felt quite familiar. It was very similar to when Lytek had called him in to look at his cabinet. At the center… he could make out the outline of one of the mortal workers. A black half-circle was glowing on her forehead. One of the more acerbic, yet hard-working line people. Hm. Lytek hadn’t said, but those exaltations must have finished up! Neat! The energies in there seemed to be shifting too. Vaguely Wyldish, but thoroughly under her control, it seemed. It even looked like Wyld-shaping might be possible in there. Now a black half-circle could say Abyssal – but factory-cathedrals were poison to abyssals and demons and fair folk and such. Plus, they were usually round round with a portion missing for the abyssal marks anyway, and they bled. It looked like one of the priestly ones. Priests of Autochthon in a factory-cathedral? No one did. It was clear from the speed some of them ran that they feared that their co-worker might have gone Abyssal. Oh well! He’d straighten that out later! It was off to the courtyards and shops nearby. Charles ate peanut butter and jelly for lunch half the time, but this was obviously a special occasion! Hm. The anima might be a problem. Those stayed up for hours upon first Exaltation, and they couldn’t be concealed with thaumaturgy. Wait! He couldn’t readily cover it up, but he could easily add some extra light effects! The anima was very evocative of the stark night sky… He added some stars and such. She could probably pass for a night sky goddess at a glance that way! Catherine didn’t seem to be thinking about that much at this point. She’d noticed that she did, in fact, have an anima. There were looks as Charles came into the restaurant with an apparent night goddess, but with enough ambrosia, they could easily get a private room… Charles tried to listen in to whatever she was hearing with thaumaturgy. After all, if it was a voice-of-god (or primordial) and it was still talking, it might well be “loud” enough to make out. It wasn’t easy… Even he could barely manage it. Whatever-it-was was deliberately trying to avoid notice except by her. He had to somewhat force his way into her mind. The voice in there was… girlish, frightened, and whispering in an incredibly archaic dialect of Old Realm? Could that possibly be the original Primordial version of the language? Frightened was strange too. Perhaps that was memories? But those shards were new. Was something going wrong out there? He could see this as an emergency protocol. There was an occult link there, but the source was heavily shielded. It seemed to be a description of the shape of weather patterns in Central Asia eight hours from now, moving on to the nine hour point. Then it stopped for a moment and the voice revised herself, saying that it would like a storm front a little farther to the east. That was even harder to hear than the rest of it… It then transitions to bird migrations, starting about an hour from now. There are a lot of pauses, some lasting upwards of five minutes. He memorized it for later study. After dessert they headed back to the Factory-Cathedral. Unsurprisingly, there were several gods there – and a Sidereal Exalt. From the blue, a harried-looking, middle-aged, Chosen of Serenity. That got a dead, shocked, silence and stares from the gods. Ms. Cress remained notably calmer, but he could see that she was trying to process the full magnitude of what he’d just said. Mrs Cress smiled – albeit with just a bit of brittle stress around the edges, something most unusual for Venus’ chosen. Charles put together a fast briefing-blip with thaumaturgy and threw in some illustrations! He used the Inkstone to put in a written report as well. In neither case, however, did he go into any detail on the voices Catherine had been hearing. It might be hard to explain how he knew. Ms Cress appeared quite relieved. So many God-Blooded focused on the flashier Charms, and not the utility effects! There was something odd about her facial expression there – but she gave Charles her card and asked that he give it to Catherine. Was the boy just guessing to try an impress her? Still, he’d reacted with… enthusiasm, and not a trace of fear, and had thrown to together an excellent report with detailed observations. The boy was VERY well informed (possibly far too well informed) for a child, although that might be expected if he was actually qualified for his job. Still, youngsters did often try to guess around Sidereals, especially of her caste. It didn’t cost them a thing – and if they were lucky they might get a credit, a connection, or a reward out of it. The Bureau of Serenity WAS one of the places with the most lax discipline. Charles was checking to see if any of the gods needed anything. He could make up the time on the line later; it could run without him for a bit – at least as long as he could reassure everyone about Catharine (which took some doing) and remained in contact via thaumaturgic sendings. That wouldn’t be too hard. The gods were quite worried. One of them had a bag of infinite brushes and computer batteries, but they were concerned about their supplies of ink and paper. There was only so much that they could carry with them, and this was likely to be a long investigation. The weren’t telling him too much either. Perhaps they didn’t yet know. He decided to tag along with endless supplies of ink and lots and lots of paper! Ms. Cress was keeping an eye on him – and they were using the gold canals for this. They were unusually crowded right now too. Of course, he was – as always – polite, helpful and (perhaps annoyingly) apparently virtually impervious to fear and nervousness.